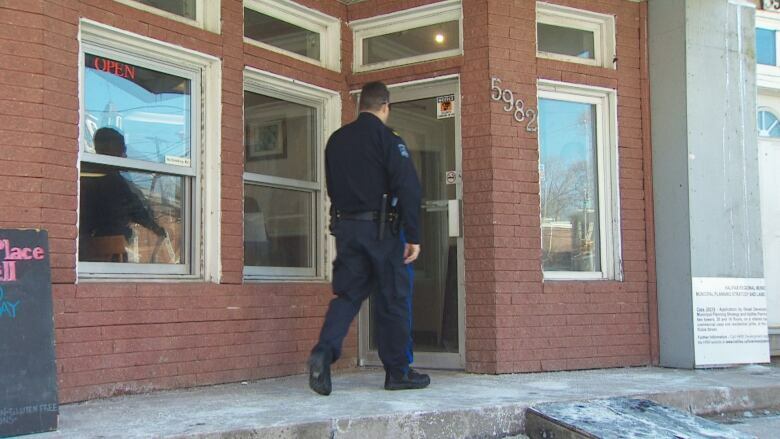 Halifax Regional Police executed a search warrant at a Spring Garden Road marijuana dispensary that was robbed the day before. Halifax Regional Police arrested an employee at a Spring Garden Road marijuana dispensary that was robbed the day before. "We executed a search warrant in relation to that robbery, came across some other illegal contraband and seized that as part of now a second investigation," Halifax police Supt. Jim Perrin said Wednesday afternoon. The 33-year-old employee of Scotia Green dispensary faces charges of trafficking controlled substances. Police had executed a search warrant early Tuesday evening as part of an investigation into the dispensary robbery, and say they're still searching for two masked people who allegedly robbed the dispensary at gunpoint Monday night. The pair allegedly took cash and product from the business, then robbed a number of patrons in the dispensary before fleeing, said police. Perrin said the goods seized by police appeared to all be cannabis, but he's waiting on lab confirmation. The business's owner, Carl Morgan, said Tuesday afternoon that one of the robbers had a sawed-off shotgun. Although no one was seriously injured, Morgan said one of his employees was hit in the head and some of the four customers who were in the store at the time were "roughed up" and had their cellphones taken. In an interview with CBC News Tuesday afternoon, Morgan said police searched the business and he anticipated that charges would be laid. He was not in the store when police arrived and subsequently arrested the employee. "Obviously, I feel it's a bit unjust," he said before the employee was arrested Tuesday evening. "I think the most important thing would be to find out who did this, and like I said, now I'm being penalized on the other end of this thing as well while they're still out there. So it's a little nerve-racking and a little stressful." Morgan said he lost about $30,000 worth of product and that he plans to reopen the store on Wednesday. Perrin said police think there are about 25 illegal marijuana dispensaries in HRM. "To sell cannabis in Canada is illegal, and will continue to be illegal," he said. He said police have investigated other dispensaries and will continue to do so. "We certainly encourage anybody to call us when they've been victimized by a crime," Perrin said. "But if somebody doesn't want to call us when they're victimized because they are actually committing a crime — I guess we'll have to leave that up to them." A police dog helped officers in their search for the perpetrators but were unable to find them. Police say the robbery investigation is still ongoing and are asking anyone with information about the robbery to call police at 902-490-5020. Anonymous tips can be sent to Crime Stoppers by calling toll-free 1-800-222-TIPS (8477).